Learning about yourself with the enneagram is both enlightening and enjoyable. It is a tool that helps us accept our weaknesses, embrace our strengths and shine as the amazing individuals we are. N.B. Since making this website my focus of attention has shifted to positive psychology and now I work with Bailey & French to help create a happier world of work, volunteer with Action for Happiness to help create a happier society, and do Life Theming for fun in my spare time. 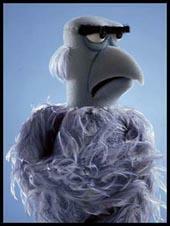 Cheer up, Sam the Eagle! Sam is an enneagram One.